Welcome back to CC guys! 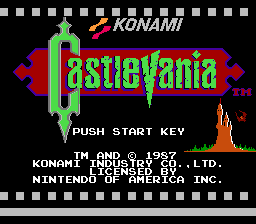 This quarter we are tackling Castlevania, a title dear to many. It's creation planted the seeds for the later PSX title: Symphony of the night (with many installments in between), whose RPG elements, when mixed with Metroid's shortcut centric, interlaced maps, would go on to create the "Metroidvania" style of games that are so popular in indie development today. But let's not get too ahead of ourselves, as we are here to go back to the basics and reflect on not only what made this game great, but what could perhaps be improved graphically with a modern critical eye. The purpose of this CC is to analyze what does and doesn't work about this game from a visual standpoint. Once the discussion get's going, take this information over to the activity where you are given the task of revamping a map for a more interesting, organic look! Feel free to add more screenshots in the thread if you like. I'm a pleb that got too frustrated with Medusa heads to capture much of any later levels. 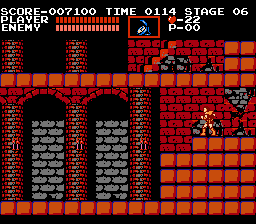 Castlevania 1 is UNROM. It does not have CHR ROM. 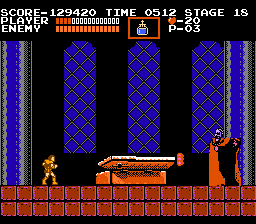 This means the PPU (NES' video card basically) is reading from RAM, not ROM when it displays Castlevania's sprite tiles and background tiles. The game must copy tile data from its PRG ROM (a separate eprom tied to the CPU not the PPU) to the CHR RAM. 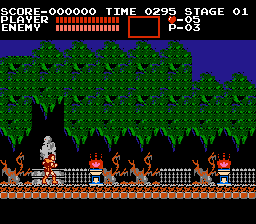 Graphics can be compressed in CHR RAM games (since the CPU can transform the data to what the PPU expects before it copies it to RAM), but Castlevania does not appear to do this. CHR ROM on the other hand must be stored in the right format, because it's ROM and can't be modified. 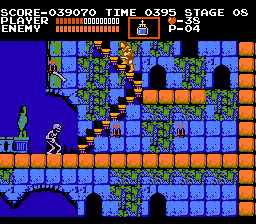 NES has two sets of 256 eight by eight tiles in memory at any given time. Usually one set is used for the background, and the other is used for sprites. 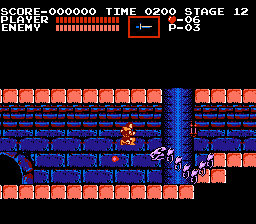 NES can display 64 sprites at any given time. 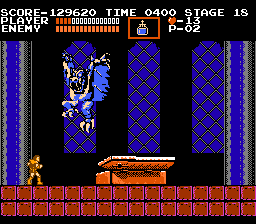 Castlevania takes advantage of an 8x16 sprite mode. This lets one cover more of the screen with sprites than 8x8 mode (there is always a limit of 64 sprites, but 8x16 sprites are bigger). It also allows one to use both of the 256 tile sets to display sprites, but there's a caveat. Two adjacent tiles MUST be used, even for a sprite that is meant to be 8x8. On the left is the "sprite" set. On the right is the "background" set. But you'll notice a very common sprite on the background side: The heart pickup. You'll also see it has a blank tile immediately to its right. This is because the bottom half of an 8x16 sprite MUST use the tile to the right of the top half. If that tile were not blank, the heart would have those not blank pixels drawn below it. You'll see some other things that are clearly sprites on the background side. The bottom 7 rows of 16 tiles do not change. The 8 tiles in the middle of the 2 rows above the bottom 7 rows also do not change. 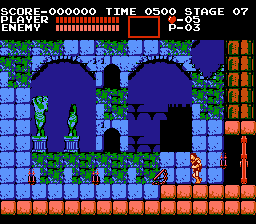 This means to create a proper Castlevania level, you must use only 128 unique background tiles in it! I like most things about readability. Belmont as well as walls and walkable surface are bright warm colors and backgrounds are mostly cool. Obvious departure from this is fully red crypt on the 2nd level. 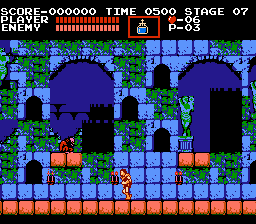 Square orange blocks look boring, but surely you can't expect much from 1986 game. Also immediate start area look a bit busy on Belmont's level due to orange trees and fires. Though it's extremely short and devoid of enemies, so I guess it doesn't matter much in terms of gameplay. Finally! These threads are pure gold. I feel like I'd have to view the art on a big clunky CRT to be able to give a fair critique. The bleed makes such a difference, especially with fewer colors and lower resolutions. 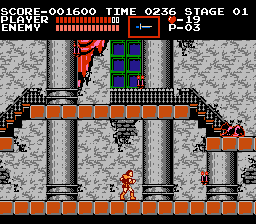 As somebody attempting to emulate this art style for a current project, these Castlevania critique threads have been very educational. I look forward to seeing what goes down in this one. As Alucard would put it, "I'm interested in this." I'm interested to see where the conversation goes as well. I didn't play this game when it came out, but I imagine that those pastel-ish colors mixed with the dark backgrounds would have set the game apart graphically from most other games at the time. That's what I notice most about it now, anyway. Man I love me some CV1. 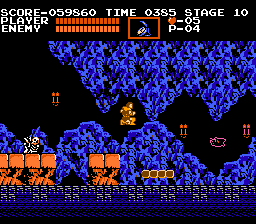 I always liked how a lot of the graphics have a drawn look to them, a lot of art not looking like they put much thought into single-pixel placement when being made. Maybe they did more than I can know, but it definitely has that impression on me. I dislike some of the art though, for example the leaves of the trees at the beginning or the rocks in the waterways with the mermen. They can be pretty badly realised, not looking much like real rocks or leaves. Also not much effort was put into hiding the tiles in some places. CV3 did a much better job overall, but maybe lost a smidge of the charm of CV1? I'm interested to see where the conversation goes as well. I didn't play this game I got the zcode when it came out but I imagine that those pastel-ish colors mixed with the dark backgrounds would have set the game apart graphically from most other games at the time. This game almost has a luminous feel to it. I like the graphics but there's not a huge amount of attention to detail. Ryumaru, I'm sorry for necroposting, but do you mind telling me what program do you use to get those graphics that you posted in spoiler? When using Tile layer pro or YY-CHR I get something sligtly different. Some gfx are the same like yours (letters and HUD), but sprites and backgrounds are messed up. I got those graphics. The "gameplay" ones in the animated gif were taken from current memory using FCEUX's PPU viewer. The very tall image was taken using YYCHR. 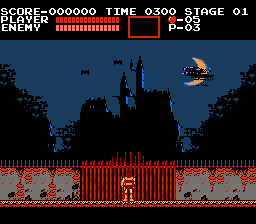 Because Castlevania is CHR RAM, it is under no obligation to have its graphics byte aligned (or even uncompressed) in the ROM itself, since it writes the proper data to PPU memory at run time. Your YYCHR GUI might look slightly different, but the arrows/+/- on the right shift where it starts looking for graphics by various amounts. For CHR ROM games it starts at the right place because where CHR ROM is is a feature of the .NES file format.